Review of Boon Kriek Mariage Parfait (2009) | Beer Apprentice - Craft Beer News, Reviews, Interviews and Info. Hello everyone. For today’s craft beer review I’m going to be trying the Boon Kriek Mariage Parfait (2009) produced by Brouwerij Boon located in Lembeek, Belgium. I have always found these Mariage Parfait beers to be very nice, so I’m really looking forward to tasting this particular version. The website, boon.be, had this nice description of the Mariage Parfait. 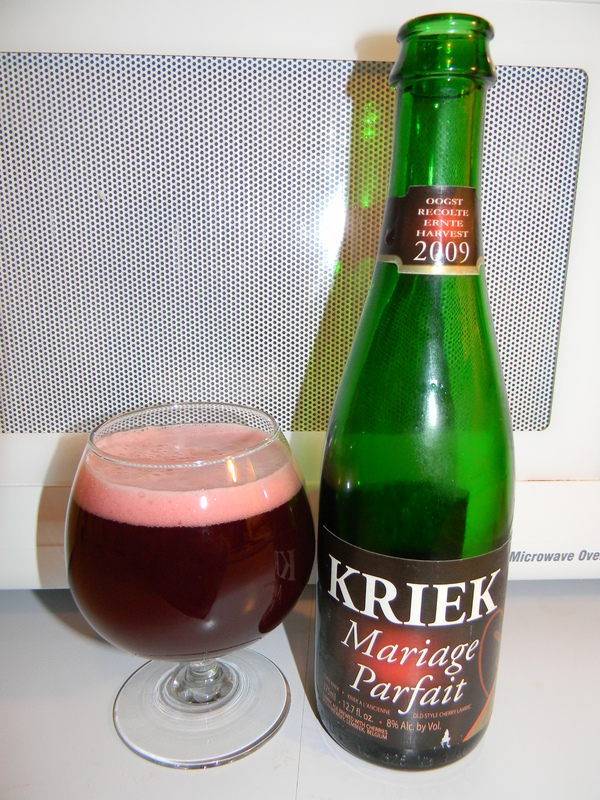 Kriek Boon Mariage Parfait consists of 1 year-old heavy lambic flavoured with overripe cherries, 400 grams per litre. Longer aging in small oak barrels gives it its special flavour. The lambic is bottled and stored in an air-conditioned room for six months of secondary fermentation. Kriek Mariage Parfait has an alcohol volume of 8%. It keeps for a minimum 20 years, and is ready to drink after about 2 years in the bottle. This is perfection in kriek beers. Try it and admit that it surpasses the best wine. This brew came in a 12.7 oz. bottle and it had an ABV of 8.0%. It poured a very deep rose to ruby red color. The cap was strawberry pink. It was sized well, but it was a bit fizzy and soapy though. The retention time was slight and the lacing was a touch thin, however it still looked attractive in the snifter. The nose released a strong hint of sour black cherries. Wafts of oak and earthy tones combined with a light mustiness and a smidgen of funk helped balance the rather tart bouquet. As it warmed somewhat it began to get even more complex and defined. Further aromas of red apple and raspberry started to protrude and the barnyard funk really started to pop. Quite a beautiful fragrance in my opinion. The taste was not overly tart or sour in my opinion. It was still prominent, however it didn’t seem to be as strong as the smell. Savors of cherry, blackberry and raspberry were the fruits that stood out the most. It was kind of tart and only a little acidic. The oak and funk, like the bouquet, commenced after the brew was allowed to sit and breathe. Overall, it was a little more relaxed than I thought it was going to be. Albeit good. The mouthfeel was medium bodied. Only a smidgen sharp. Nicely crisp, dry and snappy. The carbonation was fairly lively and no heat or warmth was felt from the alcohol. After the swallow an excellent dose of character was left behind covering the palate. Well, this is another very good brew in my opinion. I really enjoyed drinking it. The complexities were extensive enough to warrant some serious contemplation and discussion. It’s an extremely well made beer and the drinkability was altogether good. That may have had something to do with the graceful mellow funk and sourness in the taste. It’s easily worth a try if you can obtain a bottle that’s for sure. So, with that being said, grab a Boon Kriek Mariage Parfait (2009) and give it a try. I’m almost positive that you guys would like it.